I have abandoned this knife and when eventually getting it to cut will make something smaller, however I still 'need' to prove it 'will' cut. This is the third time I have ground a bevel. There is deffo not a wire edge on this bevel. The bevel is thin on the edge. I feel I am becoming a nuisance on here. Just a side note, you could gain a little more edge stability over the long haul by austentizing at 1425°F to 1450°F instead of 1500°F, depending upon your chemistry and previous treatments. The wire edge is not necessarily seen Robert but is felt with a finger tip as a slight drag when you use your finger to feel from the spine past the edge. After seeing the edge under magnification I could then see the wire edge enough to be able to hang a nail on it!! Exactly what I was speaking of. Usually I can feel a wire edge. However it could be cause the (ole eyes are not as good as they used to be)! I could not feel that wire edge it was very small. And ever time I ran it on a stone it would roll over to the other side and I could never get it up to that hair popping edge I was looking for. When John and Ken both said they thought that was the problem, it was like NOPE! I already felt for it!! Evidently my fingers are going bad as well as my eyes!! Once I grabbed the magnifying glass I actually saw the wire edge and I found a finger, that had a nail on it and, now knowing what direction the wire was hanging I could catch it with my nail!! With extending the width of my first bevel as in photo it has made the cutting edge narrower so it is cutting paper relatively easy but it ain't paper I wanna cut, moore like wood and rope and be abused.. I have been using a 1 x 30 belt sander for sharpening and sharpened 100s of 'ready made' knives with it EASY. NOT SO with my own knives. This one will not sharpen either. PS just thought, is my BIG bevel steep enough??????????????????????? I am really fed up, will someone please give me a really sharp knife for my throat, lol lol lol . 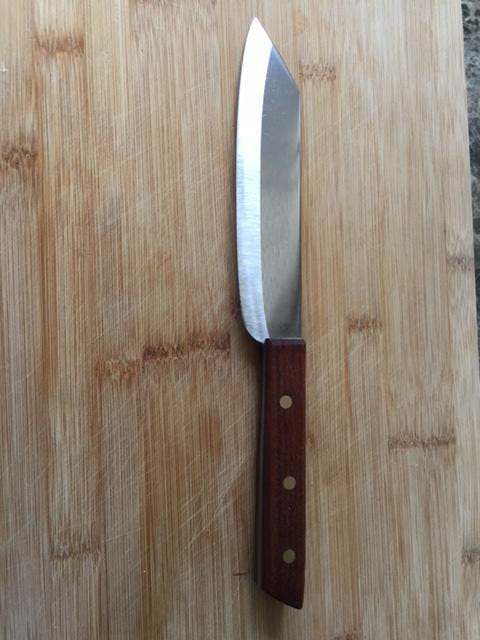 Due to my unsuccessful sjarpening and general grinding this knife is made from the above cleaver. If you don't raise a burr, it will never be sharp. In my experience the burr (wire edge) is pretty easy to see. It needs to be even and uniform along the whole edge. Then it needs to be removed. I prefer hand stropping. It can be done on a buffer but requires a very light touch. Too much pressure, too much time and/or improper angle or technique and your knife will be dull. Thank you fr that JD. I do it on a buffing wheel HEAVY HANDED, will do the light touch tomorrow and try your explanation. 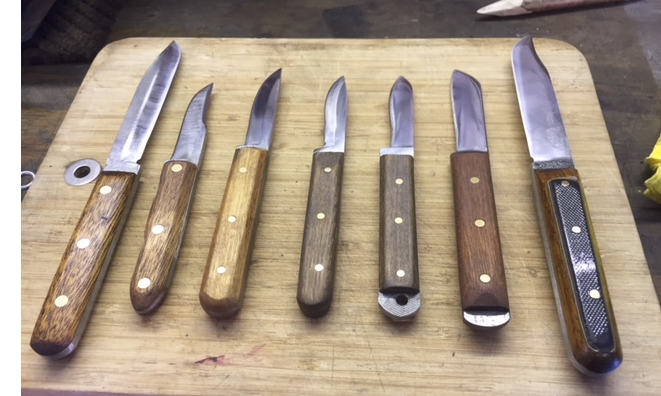 This afternoon I raided my reject box and discovered 7 knives which would not sharpen, I reground 2nd bevels and polished on my cloth wheel LIGHTLY , spme I had to do twice in places, all 7 knives are not any longer REJECTS. These knives were some of my first FILE KNIVES. I am delighted, THANK YOU TO EVERYONE. I have only been on this forum for a few weeks asa greenhorn, the help, advice from experts has been a boon to myself, I have improved a lot. It is a real eye opener when you go back into your reject drawer after you have learned a fw new things and see that what once had been a throwaway is now abe to be saved into a decent working knife. Good show Robert and the more you find the more you will see when you look at what you have done in the past. Since I have started using 1080+ on only 3 knives 2 6 inch blade ones have been very successful withe tempering following the advice of JW and others, 2 hours at a checked main electric fan oven temperature of 400 degrees. This last one is a small very clean 3 inch blade which I left in the same oven at the same temperature and time and it turned quite a bit of blue, I am worried. Ater 1 hour it had turned a really nice golden colour but I put it back as it had e not done the 2 hours. I was confused as to what to do so I put it back after cooling to hand touch for the full 2 hours. Where did I go wrong guys?